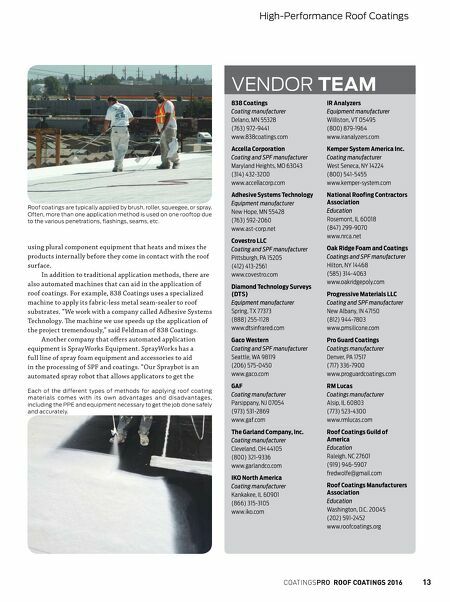 12 ROOF COATINGS 2016 COATINGSPROMAG.COM would be, too. According to Josh McKain of Progressive Materials, if SPF is being installed, repairs to the roof before the foam is applied are important if the repairs are significant. "Some small problems can be encapsulated by the foam itself, and, therefore, repair isn't quite as important as it is with coatings," said McKain. If a coating or coated SPF system is chosen, it is vital that the substrate be clean and dry prior to the application of the material. Most often, the roof surface is pressure washed to remove all dirt and debris. "A clean, properly prepared substrate allows for good quality adhesion of the coating to the substrate. Good quality adhesion is a preventative for potential issues down the road. e substrate should be free of dust, chalking film, bitumen exudate, greases or oils, and other loose debris prior to the application of coating," said Kirby of RCMA. Inspect That Roof For applicators to know exactly what they are dealing with when it comes to the condition of the roof, pre-job instal- lation inspection is an important aspect to each job. ese inspections assure that defects in the existing roof are identi- fied and corrected before the installation begins. Having accurate information about the locations and extent of moisture damage is critical to correctly analyzing the situa- tion and making dependable, cost-effective decisions. "Infrared roof moisture surveys can pinpoint and document areas of moisture damage beneath the membrane. Armed with this information, roofing contractors can be sure that they are removing and replacing all the water-damaged areas prior to applying roof coatings or SPF," explained Peter Brooks of IR Analyzers, one of the companies in the industry that offers a suite of nondestructive moisture testing equip- ment, including infrared, nuclear, and electrical capacitance surveys. RoofscanIR, Diamond Technology Surveys (DTS), and Stockton Infrared ermographic Services are also companies that offer infrared moisture testing equipment. Application How-To Roof coatings are typically applied by brushing, rolling, squeegeeing, or spraying. "Product base chemistry, viscosity, coverage rate, and roof size can all dictate the appropriate application method for each coating project. Selecting the right application method for each roof coating restoration will maximize the time and labor cost efficiency for both the applicator and the customer," said Wolf of e Garland Company. It is also common for more than one application method to be used on a project. For example, flashings, seams, parapet walls, and other penetrations may require brush or roller application, while coatings on the larger areas of the roof may be spray applied. A ll application methods for roof coatings have advan- tages and disadvantages. "Spray application has the advan- tage of covering a large footprint in a short amount of time. Some of the disadvantages are possible overspray issues and the complexity and skill level needed for the equipment. e advantages of manual application include the ease of use of application tools, as well as the lack of overspray. Some disadvantages include the slower rate of application on large projects as well as the inability to easily coat non-flat substrates, such as a standing seam metal roof," stated Reinstadtler of Covestro. W hen it comes to applying some coatings and SPF, also called spray foam, on rooftops, the material is applied High-Performance Roof Coatings Before installing a new coating system on a roof, it is important to complete an inspection. This will help the contractor have the information to make dependable, cost-effective decisions. 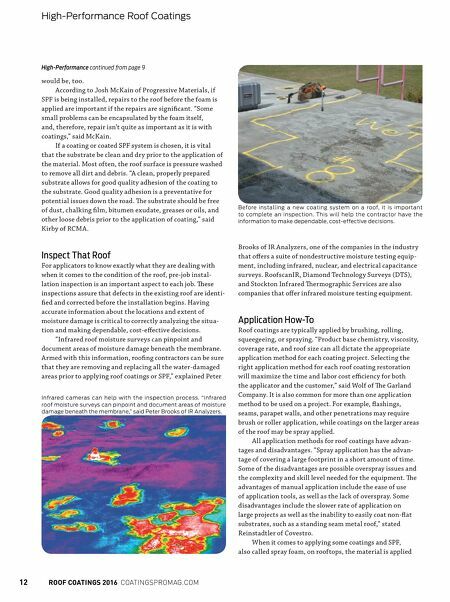 High-Performance continued from page 9 Infrared cameras can help with the inspection process. "Infrared roof moisture surveys can pinpoint and document areas of moisture damage beneath the membrane," said Peter Brooks of IR Analyzers.